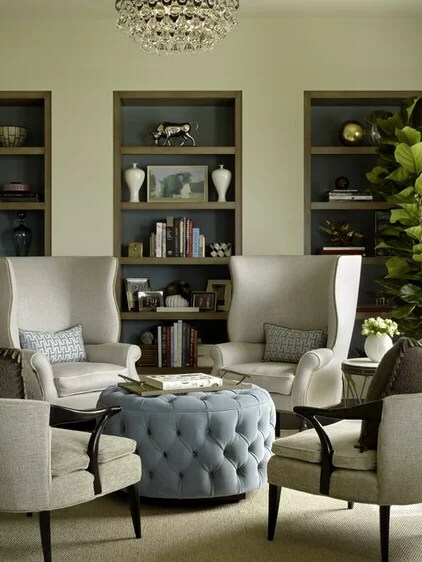 Because of their sheer size, bookcases make a natural focal point in a room. Why not take advantage of that fact and treat your bookshelves to a colorful makeover? A fresh lick of paint, whether bold or subtle, all over or as an accent, can completely change the look of your shelving — and your entire room. Here are five ways to use paint to transform your shelves, plus styling tips to make the most of your shelves’ new look. 1. Bright backing. Painting just the back of a bookcase creates a fresh, current look that will instantly wake up a room. Either watery aqua or sunshine yellow with crisp white trim would be ideal for a summery living room. 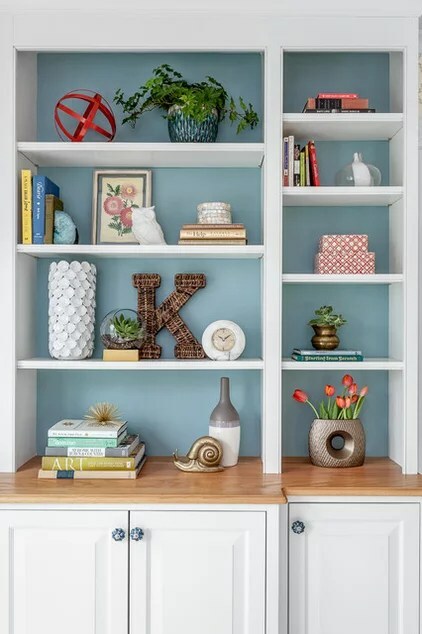 Styling tip: Take painting your bookcases as an opportunity to pare down your collection of books and objects — aim to keep at least one-third of each shelf empty. When you paint the back of a bookshelf, it is especially important to leave some free space so you can see the color behind the objects. Mix things up by alternating stacks of books with objects, or try leaning a few taller items behind the books to add depth. For an even bolder choice, try hot pink, persimmon orange or bright red — these juicy hues would work well in a dining room, playroom, or small study. Crisp white in the rest of the room keeps things simple, so the bold color doesn’t overwhelm the space. 2. Subtle. Bold hues not for you? Color doesn’t always need to hit you in the face to be effective — why not try a soft but rich café au lait color on the backs of your shelves instead? Surround the bookcase with a range of warm neutrals for a cozy and sophisticated look. 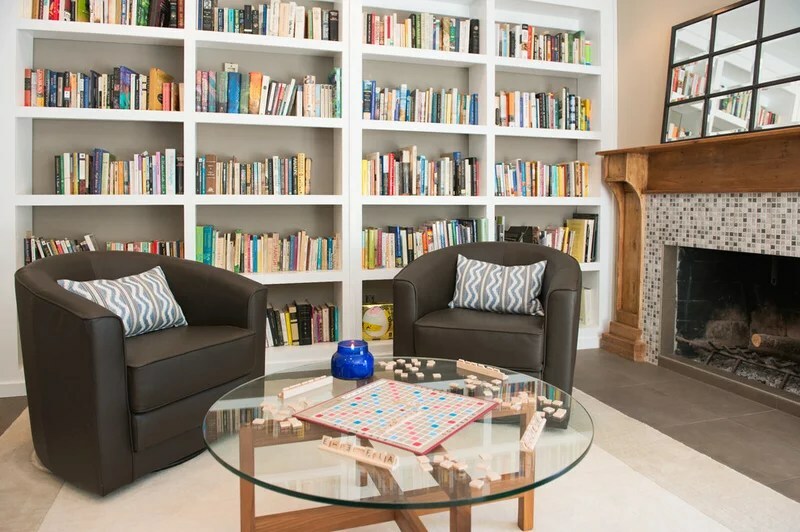 In this living room, freestanding bookcases are painted just a shade darker than the walls. This helps the bookcases feel like an intentional part of the room’s design — more like built-ins. 3. Seamless. Paint bookcases to match the walls, trim and woodwork for a polished, decorated look. Paint that’s a deep color (like the one shown here) tends to work best in smaller rooms. 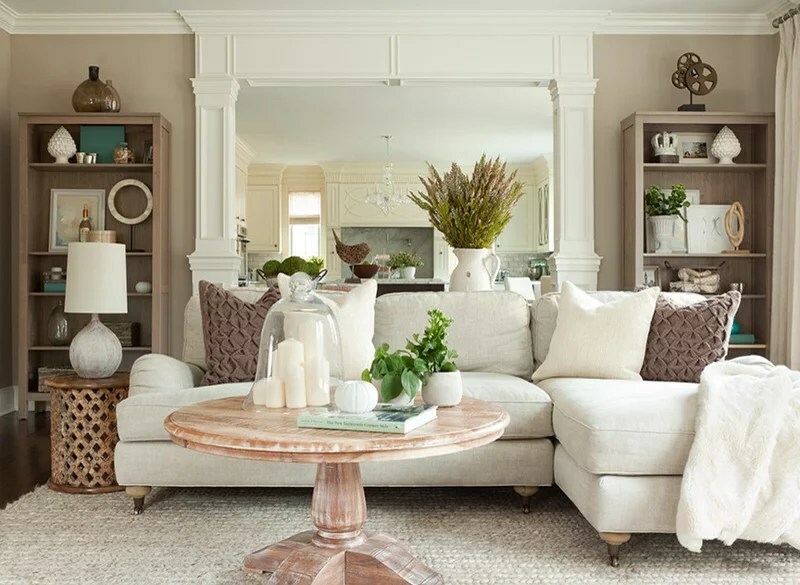 In a bigger space, try the same seamless look in a soft, neutral hue such as taupe or buttermilk.Styling tip: Fully painted bookcases call to mind a gorgeous old library — play it up by filling shelves to the brims with books rather than fussing with styling objects and stacks. Sconces mounted on the edges of shelves would make a nice finishing touch. 4. Two-toned. 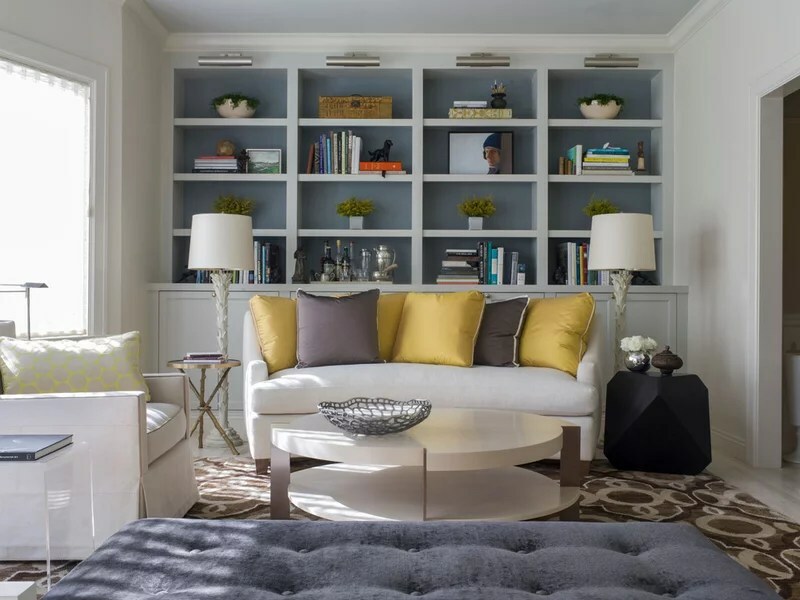 With some of the pop of painted backing and the richness of a seamless look, two-toned bookcases offer a little something for everyone. The key is to choose two hues with the same value (lightness or darkness) for a pairing that’s easy on the eyes. Or, for a different take, choose one hue and pick a lighter and deeper shade of it for the back and trim of your bookcase. If you can repeat a color used in your furniture, so much the better. Notice how the blue of this ottoman is repeated in the shelf backing. 5. Dark. 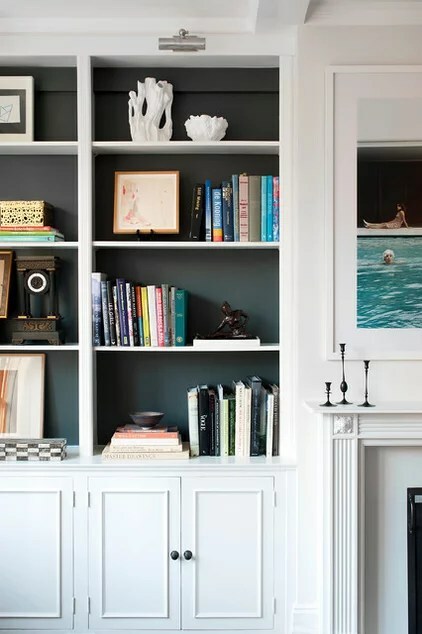 Whether you choose to paint just the backs or the whole thing, using a dark color is one of the strongest statements you can make with your bookcase. Black is classic, but nearly black-blue, green and gray are chic choices as well. High-gloss paint creates a glamorous look, but be aware that it will also make every flaw show up — so use high gloss only if your shelves are in great shape. Styling tip: On dark shelves contrast is important. Hunt down some bright white objects that will pop against the deep color. To help dark shelves settle into the room, choose artwork with the same dark hue and hang it on a nearby wall.Tell us: Do you have big built-in or freestanding bookcases? Have you ever painted them — or would you like to?